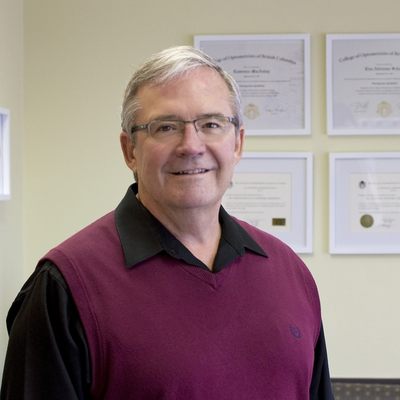 Dr. Lawrence MacAulay graduated from the University of Waterloo in 1978, and began practicing at that time in Invermere and Golden, BC. During his career, he has been passionate in providing patients with excellent eye care, and also with serving the profession of optometry. He began practicing in Armstrong in 1982 and has also practiced in Vernon and Salmon Arm. Dr. MacAulay has served as both the Okanagan and Kootenay Regional Councillor for the BC Association of Optometry, as the Chair of the Board of Examiners of Optometry in BC, the Registrar for the Board of Examiners in Optometry in BC, the Registrar of the College of Optometrists of BC, and as Director and Treasurer for the Canadian Examiners in Optometry. Dr. MacAulay also provides eye and vision care in Grand Turk, Turks and Caicos Islands. He has made 53 trips to Grand Turk since 1988 to provide eye and vision care to the patients in the Turks and Caicos Islands. 15 of those trips were in his own airplane! His recreation consists of sailing in the Gulf and San Juan Islands with his wife Donna, and flying his airplane as much as possible. He has flown it across Canada to Halifax and up to the Canadian Artic including Tuktoyaktuk. He has also flown across the United States to Miami, Nashville, and to the airshow in Oshkosh, Wisconsin many times.